Sometimes choosing garments for Rate the Dress is really hard, and I pick dud after uninteresting dud. Sometimes I find it so easy to find interesting frocks – whether fabulously interesting, or awfully interesting. Let’s see if this week’s chiné a la branche themed pick can continue the streak of compelling dresses. Not everyone loved last week’s pick, but it definitely seemed to have struck a chord with a goodly percentage of the readership. Only one score was less than an 8, and a whopping 54% of the votes were perfect 10s. Since green was so popular last week, I thought I’d keep with the green theme. I’ve also stuck with the idea of a dress that is both visually cooling, and warm and cozy. *wondering what chiné a la branche is? Read my terminology post on it and find out! This ca. 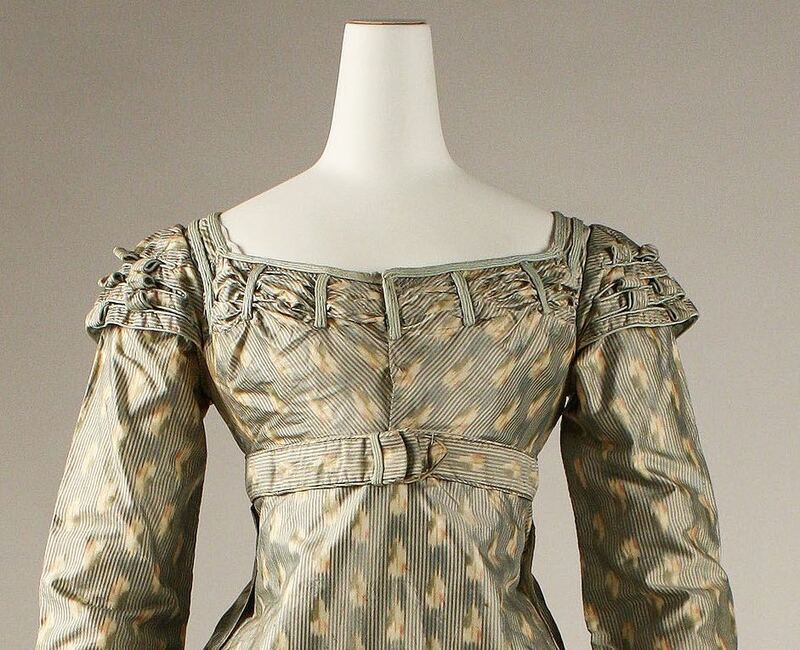 1820 dinner dress has been re-made from an earlier late 18th century dress. 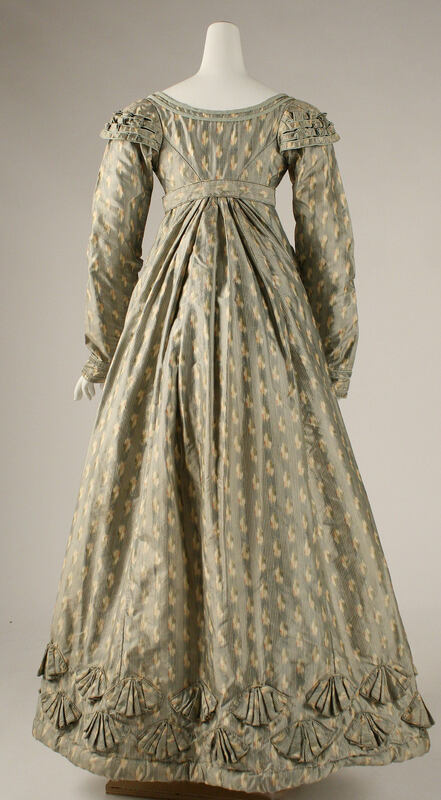 The Metropolitan Museum of Art holds not just this dress, but an earlier bodice, and even earlier sleeves. This suggests that the fabric had been unpicked and re-made numerous times. It’s an excellent indication of the quality of the chiné a la branche silk, and of how valuable fabric was in the 18th and early 19th century. The dresses hues are quite spring-like, which might seem incongruous with the long sleeves and padded hem of the dress. The hem is a functional feature. It holds out the skirt’s fullness, and providing structure while keeping the skirts away from the wearer’s legs. The long sleeves probably had more to do with societal rules around when arms could be covered then a specific desire to add significant warmth. The fabric’s colours, with the soft sage green ground, and pink and grey accents, are very late rococo in feel. The vertical stripes, and subdued patterning, bridge the design gap between the froth of rococo and a more orderly neoclassical style. The final iteration of the fabric, with its full skirts, shell trimmed hem, and elaborate sleeve and neckline detailing, is very Romantic era in its design sensibilities. Even as the dress looks towards the romantic era, it balances order and extravagance. The shell effect at the hem are soft and naturalistic, the bodice trim more orderly and geometric. What do you think? Does this dress successfully bridge the three design eras is owes its aesthetic to? Does it balance romance and orderliness, spring and winter, restraint and extravagance? I particularly like the fabric manipulation to create the shell effect on the hem. Overall it gives me a sense of balance between soft and hard, straight and curved. I am torn about this dress. The colors in the fabric may be spring-like, but the way they appear in the photos is drab. I think that’s because the sage green appears as lots of narrow stripes, diluting the effect. Overall the fabric manipulation work is well done. 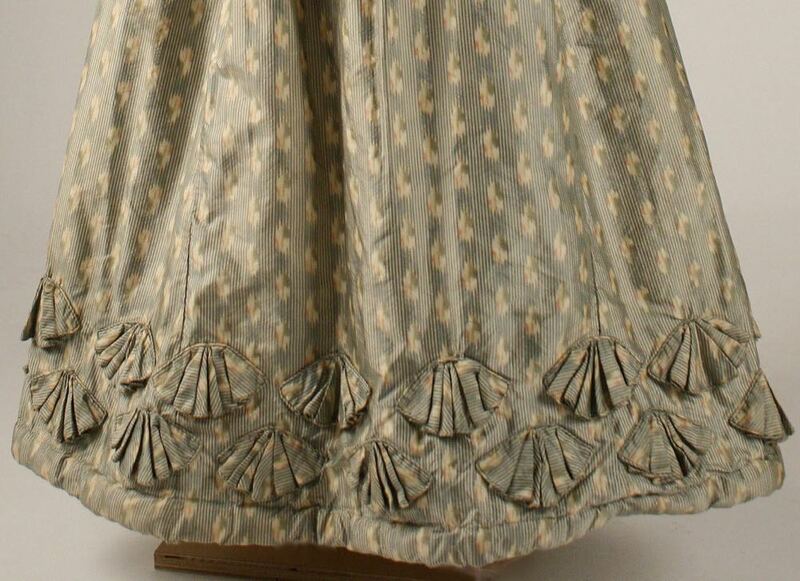 I love the shell/fan motifs around the hem. I’m less fond of the fold-and-bar work around the neckline, but I like the paldron-like folds on the shoulders. I’m assuming that the self-belt was worn with a metal buckle, and the amateurish tab fastener we see here does not reflect how it was worn. I like the sleeves, the fullness of the skirt, and the way the fullness of the skirt is directed to the back. 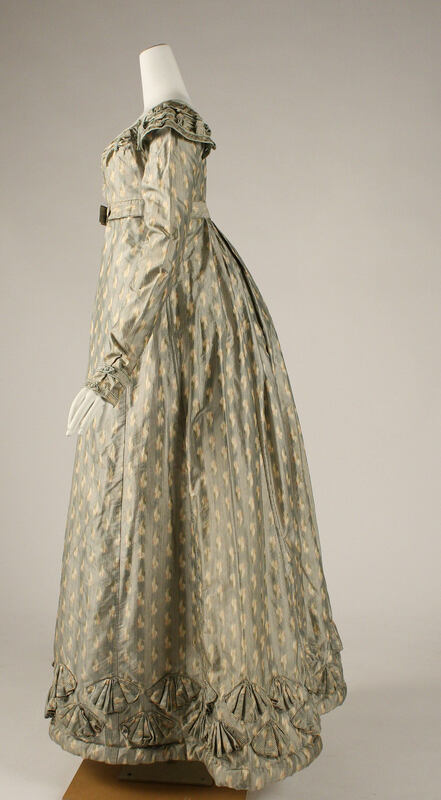 I’ve never seen an 1820s dress with the skirt fullness directed to the back before. Moreover, the seaming of the back of the bodice combines with the fabric manipulation effects to make the rear view of the dress the best by far. But the overall result, though interesting, is too drab and strange-looking to merit a 10, in my opinion. I’m not sure how it could have been improved, either, except perhaps to combine trim from a different fabric (a velvet, maybe?) to bring out the green in the silk. 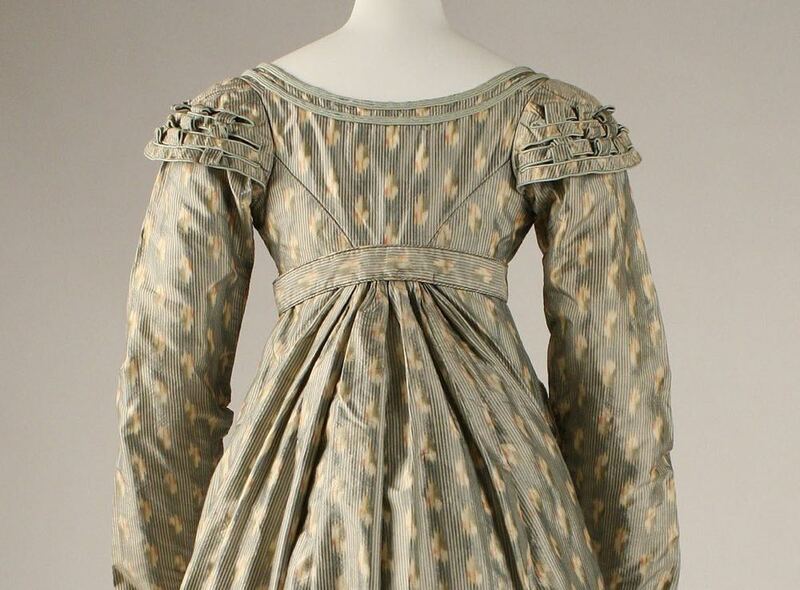 6.5 out of 10 for the drab coloring and the peculiar ornamentation of the front bodice. The print bothers me, much the way some Impressionist paintings bother me – it’s too soft and indefinite. But it’s growing on me, and seeing the shell embellishments (emshelliments!) at the bottom help fix it – the print gives the dress a very soft, mixed sea-and-sand vibe. But I find the front view just stunning – the neckline, the belt, the shoulders, the cuffs – it’s really lovely, feminine and imposing while still being youthful. Yes, thank you yes. I love the color, the cap sleeves on top of the long sleeves, and the embellishment at the hem stole the show. Then I saw the back and I smiled. I would wear this on this age without changes. Perfect 10/10 for me. I find it quite lovely with the exception of the sleeve caps. It seems one design idea too many. I would have preferred the neckline folds and bars carried over to the sleeve cap, if necessary. The back seaming and gathering is lovely. Anyhow, the geometric bodice–despite the artistic weaving of the cap sleeves–don’t harmonise well with the more naturalistic bottom. But man, I love the sheer vim of the dress and the thought processes of the dressmaker/dress-alterer. I like the fabric and the back view is great. The sleeve caps are adorable. The shell trim is interesting. The front view is, unfortunately, spoiled by the belt, I think. Still, I like this one a lot. I’m in love with the fabric! No wonder it was used and re-used so often. I also think the upper bodice trim may have looked better if it were a match with the Hem. I question why the gathered “rump” area. Maybe her conscience just wouldn’t let her cut into this larger piece of fabric, which may have come from a panniered skirt. I give it a 9/10 for beautiful fabric. And I love this era of fashion. In a very general sort of way, I like it a lot. The color and print issues are, I believe, a problem with the photography, not the dress. I’m not a big fan of the padded hem, but I get the practicality of it. The fabric is outstanding! I’ve never met an ikat I didn’t like. I also quite like the padding and the shell-like decoration at the hem. I like the view from the back – the fabric pleated into the belt gives a nice shape; however, the front belt area looks a bit wonky to me. I’m also not happy with the too-full, shapeless sleeves. I wanted to love it because my primary love is textiles – and this textile is gorgeous – but this dress just doesn’t quite cut it. Perhaps in its earlier life it was a marvel worthy of the beautiful fabric. This is a perfect example to me on how you can pick and mix the best elements of different eras, and turn it into a really beautiful gown. At first I was hesitant about the trim around the neckline, but the more I looked at it the more I liked it. The dress needed some balance to all the sweet and romantic elements. I tried to look at things I didn’t like, but I can’t really find them so it’s a 9,5/10 from me. Just looked at the other bodice & sleeves which I much prefer. Where did the extra material come from? Was this remake for a shorter person? Perhaps for a daughter or niece, using material from the skirt. Anyway, it shows how expensive fabric was treasured then. The fabric is lovely, a very English colour because our light does not do bright colours & also because of the natural dyes used then. As I like the original design better I give it 8/10. I really like this dress! Especially the shell motif around the hem, and the gathered back (so graceful!). The long sleeves are warm while the colors hint of spring and would be cheerful and bright on a dreary late winter day. I really like the sage green colour. I also really appreciate that the embellishments are all done without lace or ruffles. The little shell shapes at the hem are a really beautiful example of embellishing a dress using the same fabric. I love stripes. Interesting use of self-fabric trimmings. I wonder if the “shells” were part of the original dress or if they were made later. That’s a lot of piping around them. The front looks “off” and I don’t know why. I think the bulky sleeves and the tailored bodice are at odds. It may have been fashion. It’s a nice dress, a well-made dress but not an exciting dress. This one is one of my subtle favourites. 10/10! I love this dress. I don’t think my computer does justice to the color so I don’t feel I can comment on that. I can see a daughter painstakingly deconstruct her mother’s gown, saving her favorite pieces (the shells and sleeve/neckline details?) to make her gown special. Thinking that, I see a lot of love in this piece. Some of the mounting is a bit odd – obviously this was a quick record shot job, but there’s weirdness around the waist and around the hem making for strange dips and bulges. Quite distracting. I really love the fabric and I think it works well for this dress. The sleeve caps are intriguing, they look almost like basket weave, but then I see loops so are they straps with half bow loops? I also like how the shell-fan-pleats around the hem echo the overall silhouette and flare and pick up on the sleeve caps. Do I love it? I’m not sure if I do. I don’t hate it. I think it’s a quite restful dress to meditate on, particularly if you imagine it mounted in a less worryingly deformed way. I’m going to say 7/10, as I just can’t quite squeeze the score any higher. Went to the Met page and they had a close up of the fabric. looks like it combines all kinds of design ideas. The dress itself is nice, but the fabric makes it loose points. The hem treatment is intresting and nice and I like the 1790’s leftover on the back side..
What a pretty dress! As someone who is poorly insulated and is always cold, I wish that more spring dresses had long sleeves. I love the embelishments on the bodice, sleeves and hem, and I love the drape of the back. The only odd thing for me is how much the skirt draws in at the natural waist from the front. I want to steal design elements from this dress. I love the bodice design, and would love to figure out how to do it in a dress or shirt of my own. That being said, the color is just not that great for me. On my screen it’s rather drab and washed out.